More coffee filter action! Your little one will adore decorating for Valentine's Day with this easy heart garland. This is also a nice way to include children of all ages and abilities in one art project. I find that when kids create together, they are even more proud of the finished product. Start by getting some arty materials to decorate a coffee filter. 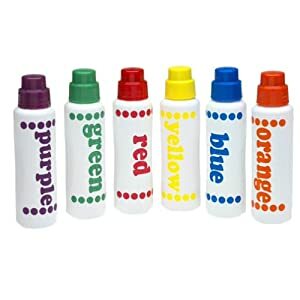 Once again, I love these dot markers. But don't get shy to use glitter glue, markers, stamps, whatever tickles your fancy! Next, lay out your string and hang your hearts. You can glue the inside of the hearts to the string or for the lazy in the room (me!) just use some scotch tape. I also dabbed a bit of glue stick on the inside so the back and front of the hearts stuck together. And here's the finished product. Pretty darn cute, if you ask me! Want your kid to have the most unique valentines? Valentines that will melt your.... crayon?